How many things in life are guaranteed? And when it comes to rifles, rock-solid accuracy guarantees are few and far between. Cooper promises its centerfire rifles can produce 1/2" 3-shot groups at 100 yards using hand-loads. Sounds good right? But that pales in comparison to the accuracy guarantee Clay Spencer offers on his Virginia "Hog" Rifle. Built as a package on a suitable receiver provided by the customer, Clay guarantees his Virginia "Hog" Rifle will put 3 shots in 1/4" at 100 yards, if you use his recommended loads and Spencer or Euber bullets. Yep, Clay offers an accuracy guarantee TWICE as good as Cooper's. Now, we all know that you can spend $3000+ for another smith's custom rifle and it may or may not deliver that kind of accuracy. Clay takes the guesswork out of the equation and we commend him for building such accurate rifles. This week's rifle is chambered in 22BR with a .243" neck. 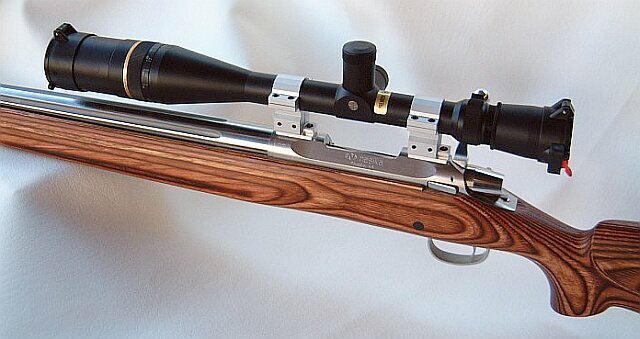 This beauty sports a Nesika action, pillar-bedded in a laminated roll-over comb Holland varmint stock. The action is a model "J" special-ordered with cone bolt-head, Remington "T" tang, and an enlarged port. The barrel is a 24" stainless fluted Spencer, pull-buttoned with six lands and grooves. Clay tells us this particular barrel is a "hummer". It easily hit the 1/4" accuracy mark for 3 shots at 100 yards, and it can do that for 5 shots as well. In fact, the very first 5-shot group shot from this gun measured .193". Clay has a great deal of experience building accurate 22BRs and 6BRs. He's smithed many of the winningest groundhog match guns on the East Coast. Clay did a really nice job with the inletting, and the bedding and pillar-work is as clean as you'll find anywhere. Clay Spencer also builds many of his Virginia "Hog" Rifles with the McMillan Field Marksman stock. We like the look of wood, but the glass Field Marksman is impervious to the elements and you can order it with moulded-in camo coloring. 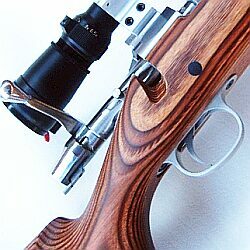 Clay can make you a Virginia "Hog" Rifle on other stock designs as well; wood or glass is up to the customer. Each Virginia "Hog" Rifle is a "custom" in the sense that the customer can specify his action, chambering and stock. However, Clay only offers an unrestricted 1/4" guarantee on specific chamberings: 22BR, 22PPC, 6PPC, 6PPC-40°, and 6mm BR (.262" neck). The 6BR is Clay's recommended caliber. Most of Clay's "Hog" rifles have been built on blue-printed Remington 700 actions, though Clay is more than happy to work with a custom receiver of your choice. He normally sets up the "Hog" rifles with an index-fluted Spencer stainless barrel, but if you prefer a straight contour, that is available also. With a client-supplied Rem action, the $2500 "Hog" rifle package includes action blue-printing, a Jewell trigger (1½ oz.-4lbs) with safety, and Kelbly bases/rings. The action is pillar-bedded in your choice of stock, typically a McMillan Field Marksman, fitted with decellerator pad and swivel studs. Spencer's 1/4" accuracy guarantee for the "Hog" rifle requires that Spencer or Euber bullets be used. Many folks may not be aware that Spencer now makes bullets, and they are very good, comparable with the top quality match bullets from the boutique bullet-makers. 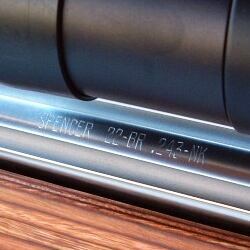 Spencer's bullet cores are all hand-made by Clay's daughter Sarah and son-in-law Harry. No machine-made cores are used. The cores are hand-seated (Photo 1) and the jackets "pointed up" by hand (Photo 2) in top-quality dies. Currently, Spencer offers .22 caliber 52gr bullets in 7 ogive, 6mm 65gr bullets in 7 1/2 ogive, and 6mm 68gr bullets in 8 1/4 ogive. Prices (before shipping) are $180/1000, $100/500, and $25 for 100. Any "short list" of American barrel-makers has to include Clay Spencer. Walk down the firing line at Hawks' Ridge in North Carolina and you'll see plenty of Spencers on top 1000-yard rigs. And his barrels regularly show up on the equipment list of match winners. There's a reason. Clay is fastidious about the quality of the steel he uses and he independently tests each lot of 416 stainless steel. His pull-buttoned barrels are all hand-lapped with closely-controlled dimensions. He stands behind his barrels' quality. It's also nice to know that the man who builds your gun also builds the barrel so there are no excuses when the finished gun is completed. HV and LV 26" BR contours run $275.00 and up. Sporter contours are $25.00 more, while Unlimited (1.350" to 1.450") barrels start at $300.00, with a $20 surcharge for 30" finished lengths. 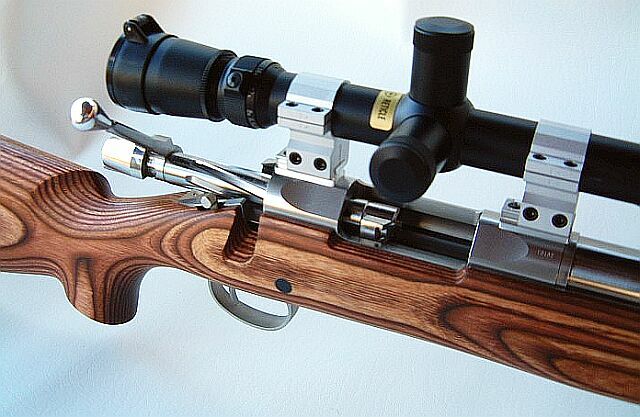 "For me to offer the 1/4" guarantee for the qualifying calibers (22BR, 22PPC, 6PPC, 6PPC - 40°, and 6BR), I need to control the neck diameter, freebore, and chambering specs. There are many reasons for this, including the fact that brass varies dimensionally from one brand to another. This means you can't just give me any old reamer and expect the gun to do 1/4". But rest assured, if you let me build your "Hog" the way I know best, the gun will deliver the goods. 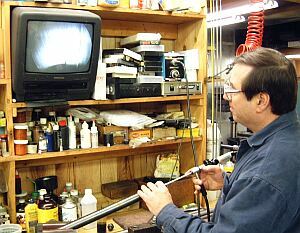 I've been making "Hog" Rifles since 1983 and not one gun has been returned for poor accuracy--provided the shooter used my recommended loads and bullets. With each gun you get a recommend powder, bullet, and OAL combination for best results. All photos Copyright © 2004, Spencer Rifle Barrels, Inc., All Rights Reserved, used by permission. All Other material Copyright © 2004, 6mmBR.com, All Rights Reserved. No reproduction without advanced permission in writing.